I have a dear friend named Cupcake. We've been apart for a little while in order for me to continue my love affair with bread, but my heart has always been with Cupcake. Cupcake was one of my first baking friends, and I worked for years to perfect our relationship. She is so sweet, but not fake, you know? She's all genuine. We had to take a break when my family forbade her from entering my house, for they said she was sabotaging their figures. 3. In a bowl or mixer, beat the sugar and butter until it's light and fluffy. Add the egg and beat until incorporated throughout. Scrape the bowl and beat for 15 more seconds. 4. Quickly mix the flour, baking powder, and salt in a dry ingredients bowl. Mix this in with the butter/sugar alternately with the heavy cream. Beat until no flour is visible, making sure to scrape the bowl often. Don't overbeat! 5. Scoop batter into the prepared cupcake liners. Spray a cookie scoop with cooking spray so the batter is easily removed. Divide batter evenly (Or, if you're me, you divide batter so they're all equal except one is giant and you claim that one as soon as they leave the oven). 6. Bake for 18-20 minutes or until a toothpick comes out clean. Let the cupcakes cool on a drying rack (If you're impatient or time-crunched like me, you can refrigerate them on the rack for 15 minutes). 1. Beat cream cheese and butter until incorporated. Scrape bowl. 2. Add vanilla and milk. 3. Slowly add powdered sugar until it seems right to you. 1. 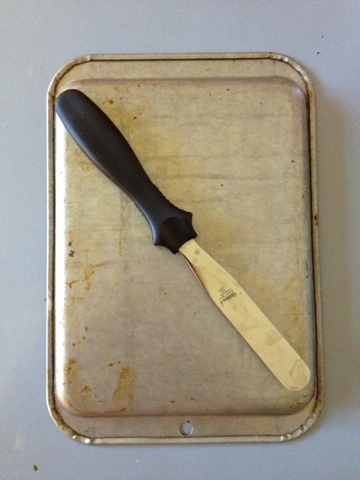 Cut the corner (1/4 inch from the very tip) of a sturdy ziplock baggie, sandwich or quart sized. Put the tip in the hole (you can use a coupler, I just hate washing them). 2. Put the baggie in a glass or cup with the top folded over the lips of the cup to make it easier to fill. Fill the bag. 3. Frost cupcakes however you desire. 4. Put coconut in thin layer on a cookie sheet and bake at 350 for 3 minutes or toast in toaster oven for 2-3 minutes or until golden brown. 5. 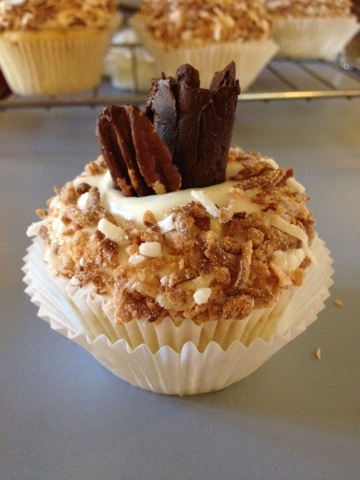 Put the coconut in your hand and quickly press it along the outer rim of the frosting on the cupcakes. 6. 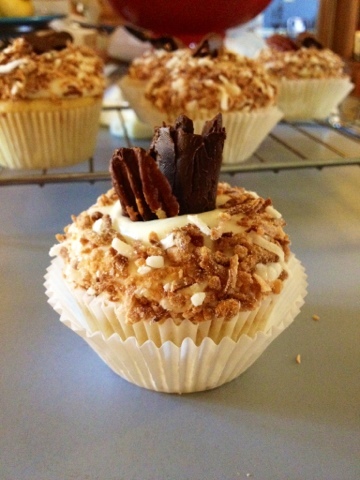 Garnish cupcakes with one roasted pecan and a chocolate curl. 1. 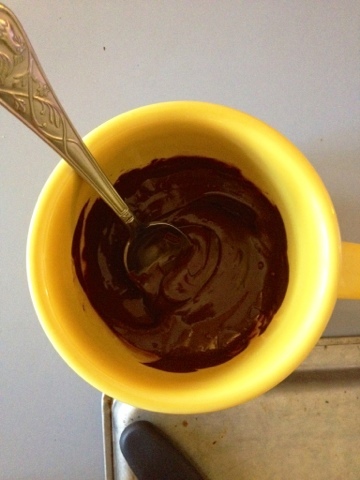 Melt 1/2 cup chocolate chips with 1/2 tsp vegetable oil. 2. 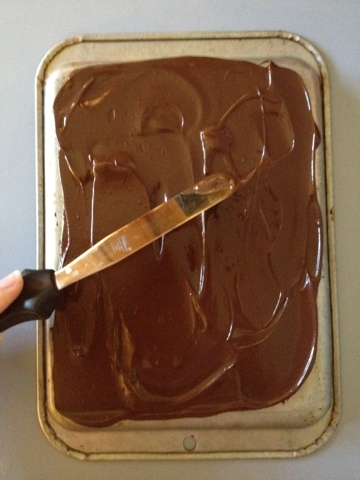 Spread along the backside of a cookie sheet. 3. Let it cool, trying to let it do so at room temperature and not in the refrigerator. 4. 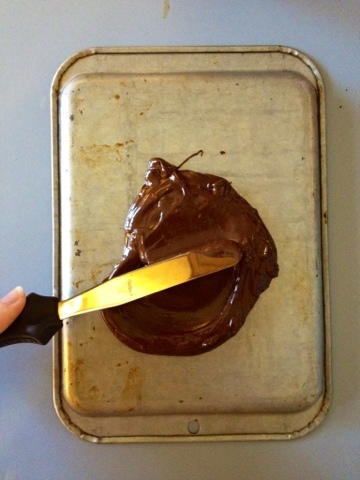 Using a cool and flat spatula at a 45 degree angle, start at the edge and scrape it, letting it curl as you go. 5. Use a toothpick to transfer the curl so it doesn't melt in your fingers. Oh Cupcake, how I've missed you.